Lost without trace age 33 on the 21st of March 1945. Son of Arthur and Flora Elizabeth Jane Oakey; Husband of Joan Elizabeth Oakey, of Gisborne, Auckland, New Zealand. Killed age 24 on the 29th of August 1942. Grave location – 9. K. 20. Sgt. 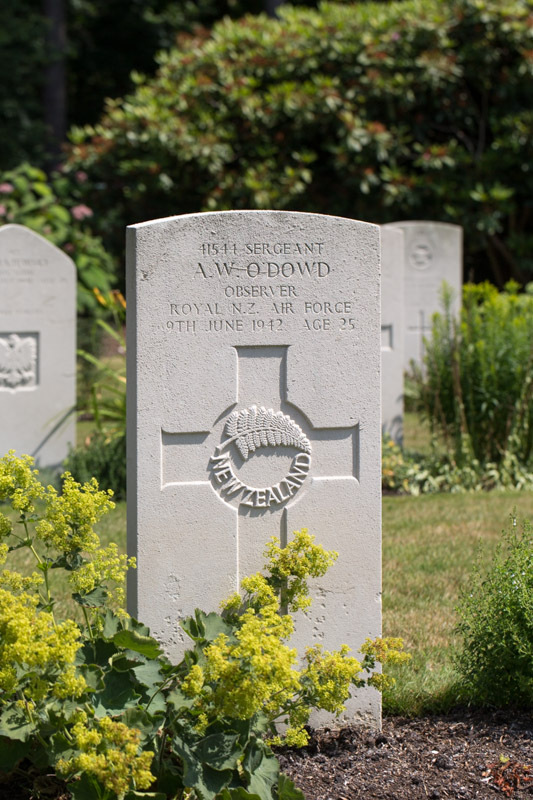 Albert William O’Dowd, RNZAF NZ41544 – Observer. Killed age 25 on the 9th of June 1942. Son of William Charles and Florence Louise O’Dowd, of Romford, Essex. Grave location – 14. C. 6. P/O Graham Edward ‘Stinker’ Murdoch, RNZAF NZ411927 – Pilot. P/O Robert Weston, RAFVR 111532 – Wireless Operator. Sgt. Leon Gaston Knight, RNZAF NZ405494 – Front Gunner. Sgt. John Lewis Morris, RAFVR 617843 – Rear Gunner. Wellington Mk.III Z.1573 AA-T was shot down, possibly by a night fighter over the Netherlands. It crashed into the Krabbenkreek between St. Philipsland and the Anna Jacobapolder (Zeeland), 20km North West of Bergen-op-Zoom. Sgt. John Herbert O’Farrell, RAFVR 1796043 – Mid Upper Gunner. Killed age 19 on the 31st of July 1943. Son of John and Margaret O’Farrell, of Dundrum, Co. Down, Northern Ireland. Grave location – 2. F. 10. Son of George and Ellen Rae Ogden, of Knightswood, Glasgow. Grave location – 6. B. 26. Sgt. 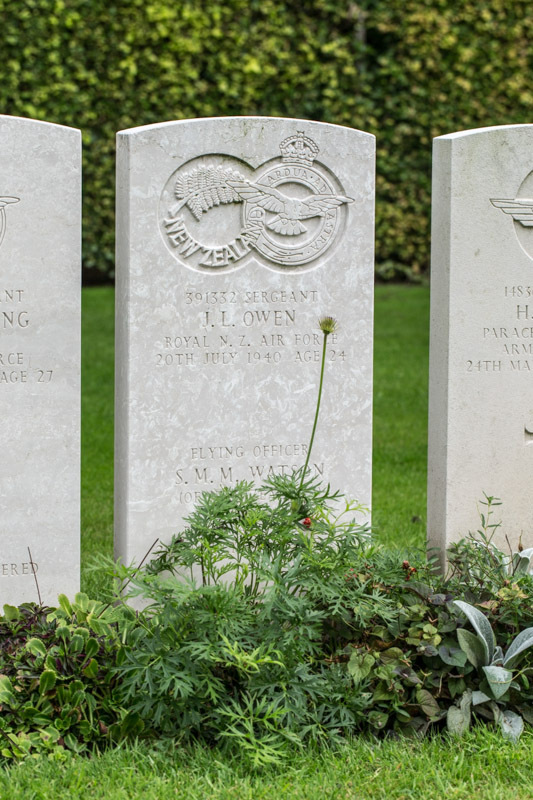 John Olive, RAFVR 978156 – Wireless Operator . Killed age 23 on the 10th of January 1941. Son of John and Ellen Olive, of Blackpool. Buried Elton, (All Saints) Churchyard, Bury, Lancashire, England.. Grave location – Sec. N. Vault 2483. P/O Brian Patrick Mcnamara, RAF 42856 – Pilot. P/O Alexander James Ryan, RNZAF NZ391367 – 2nd Pilot. Sgt. Matthew Roy Ritchie, RAF 631868 – Front Gunner . P/O Ronald Edward Ashby-Peckham, RNZAF NZ40714 – Rear Gunner. P/O B.P. McNamara (Captain) unmarried. P/O A.J. Ryan (2nd Pilot) unmarried. Sgt. Elliot R.B. (Navigator) unmarried. Sgt. J. Olive (W/Operator) unmarried. Sgt. M.R. Ritchie (Front Gunner) unmarried. Sgt. R.E. Ashby-Peckham (Rear Gunner) unmarried. Seriously injured and taken to Addenbrooks Hospital. 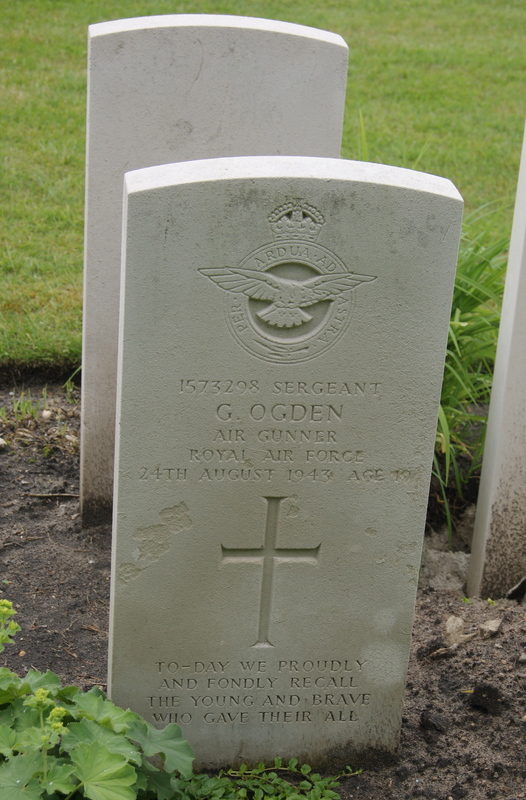 W/O Vincent John O’Loughlin, RAF 536970 – Rear Gunner. Son of Thomas and Sarah O’Loughlin; Husband of Beryl Margaret O’Loughlin, of Carterton, Oxfordshire. Grave location – 13. B. 9. Of one most dearly loved. Killed age 21 on the 13th of October 1942. Son of Stanley and Annie Orr, of Kilkeel, Co. Down. Northern Ireland. Grave location – 3. F. 2. ‘Safe in the arms of Jesus. Killed age 25 on the 28th of August 1942. Son of Professor T. G. B. Osborn and May Osborn; Husband of Marjorie May Atterbury Osborn, of Paddington, London. Grave location – 5. K. 11. Wellington Mk.III BJ.708 was brought down near the town of Melsungen, 18miles south of Kessel, probably as a result of flak damage. There were no survivors. All five crew were initially buried in the Korle Cemetery, Melsungen, but later reinterred at Hanover. 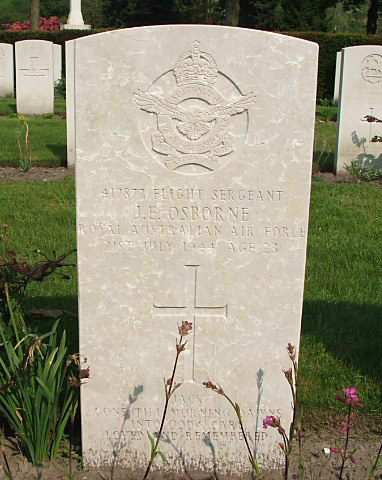 F/S John Edward Osborne, RAAF AUS.417877 – Wireless Operator. Killed age 23 on the 21st of July 1944. Son of John and Margaret Ellen Osborne, of Allenby Gardens, South Australia. Sgt. 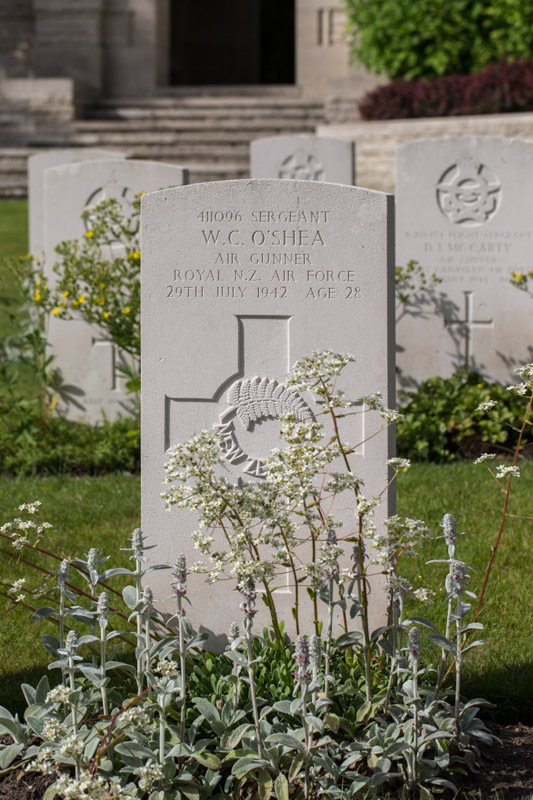 William Clerken O’Shea, RNZAF NZ411096 – Observer. Killed age 28 on the 29th of July 1942. Son of John and Margaret O’Shea; Husband of Ann O’Shea, of Dunedin, Otago, New Zealand. Grave location – Joint Grave 11. E. 8-9. Sgt. George Alister Hutt, RNZAF NZ41914 – Pilot. P/O Murray Ellis Carncross, RNZAF NZ411718 – Observer. Sgt. James Gordon McMurchy, RNZAF NZ405539 – Wireless Operator. Sgt. William Clerken O’Shea, RAFVR NZ411096 – Front Gunner. Sgt. John Henry Savage, RNZAF NZ404620 – Rear Gunner. Following a bombing attack on Hamburg, where intense anti-aircraft defence measures were encountered, Wellington Mk.III BJ.599 AA-U crashed at Steinbeck, near Stade, about 20 miles to the North West of the target. There were no survivors. All were buried at Stade, but after the war they were reinterred at Becklingen. Sgt. John Lewis Owen, RNZAF NZ391332 – Rear Gunner. Killed age 24 on the 20th of July 1940. Son of Wilfred and N. G. Owen, of Wanganui, Wellington, New Zealand. Sgt. William Owen, RCAF 58067 – 2nd Pilot. Lost without trace age 19 on the 24th of July 1941. Grave location – Panel 61. Six Wellington aircraft of this Unit were detailed to carry out daylight attacks against the above target. One of these aircraft, N.2854 captained by SGT. Streeter failed to return to base. The bomb load consisted of 24 500lbs. S.A.P. Results were unobserved by DNS.772. DNS.329 reports bombs overshot aiming point. Direct hits on sheds or warehouses about half mile S.E. of aiming point were observed. DNS.411 reports that one and possibly two hits were observed on north end of No.1 graving dock. Results were not observed by P/). Ashworth. S/L. Lucas reports that bombs were dropped in target area. Balloons were observed in the harbour. A.A. fire was very intense and accurate. Enemy aircraft were numerous and our aircraft were attacked. The weather was excellent and visibility was good. Navigation was by D/R, and map reading. Sgt. Desmond Frederick Streeter, RNZAF NZ401033 – Pilot. Sgt. William Owen, RCAF R.58067 – 2nd Pilot. Sgt. Rodney Patrick Carling, RAFVR 950217 – Navigator. Sgt. Reginald James Turner, RAFVR 913804 – Wireless Operator. Sgt. Robert Samuel Carson Craig, RAFVR 947814 – Front Gunner. Sgt. Graham Stuart Walker, RNZAF NZ401817 – Rear Gunner. There was no report from Sgt Streeter’s crew. Their aircraft, Wellington Mk.Ic N.2854 AA-U, failed to return and was officially classified as ‘lost without trace’. Numerous enemy aircraft were operating in the area and Squadron aircraft were among those coming under attack. It became clear that these attacks had a profound bearing on the loss of R2854. One of the other Wellington crews in the same formation as Streeter’s, witnessed the latter’s aircraft being targeted by a number of Me109’s and receiving several cannon shell bursts that caused an engine to fail. They last saw the Wellington going down steeply with two or three Me109’s still attacking it. Their chances of escaping would have been very slim, and it was concluded the aircraft had crashed out of control into the sea. F/S William Alfred Owens, RAFVR 1250494 – Mid Upper Gunner. Killed age 21 on the 30th of May 1943. Son of Thomas and Elizabeth Owens, of Gelli, Glamorgan; Husband of Edna Mary Owens, of Gelli, Glamorgan. Grave location – 6. A. 13. Sgt. John Henry Roy Carey, RNZAF NZ414242 – Pilot. Sgt. John Lewes Roberts, RNZAF NZ411593 – Navigator. Sgt. Percy Gibson Knight, RNZAF NZ417282 – Air Bomber. F/S Maurice Archibald Brady, RNZAF NZ39987 – Wireless Operator. Sgt. T.E. Beaver, RAFVR 1276184 – Flight Engineer. Sgt. William Alfred Owen, RAFVR 1250494 – Mid Upper Gunner. Sgt. Norman Alexander McLeod, RNZAF NZ404079 – Rear Gunner. Stirling Mk.III EH881 AA-Z was brought down at Eilendorf, outside the township of Aachen (35 miles South West of Cologne). The Captain and two gunners died in the crash and are buried in Rheinberg War Cemetery. The other four crew all escaped uninjured, either by parachute or from the wrecked aircraft, and were captured as POW’s.